A special guest in the kitchens of Delphina’s restaurants: a triumph of tastes and all the secrets of our chefs in the typical dishes of the North of Sardinia! Luca Iaccarino, writer and journalist talks about his latest rendezvous with Sardinian cuisine for the Travel Food/Piatti d’Autore column in Vanity Fair, a journey over land and sea among typical Sardinian dishes together with lots of tips and advice from the chefs at Delphina. 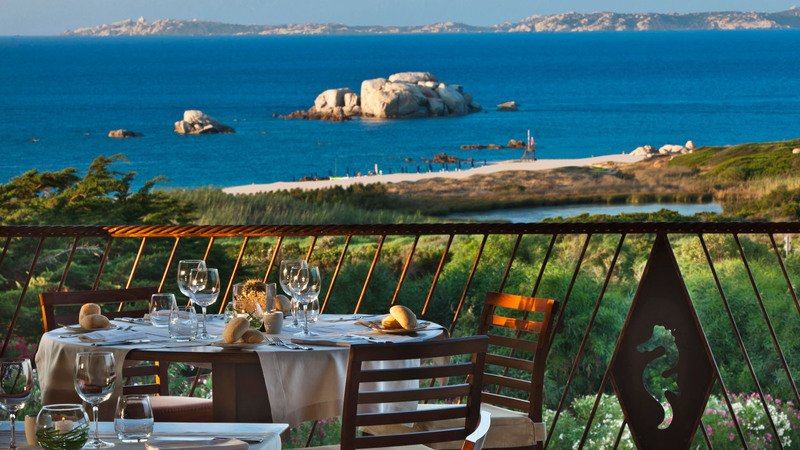 Thus Luca Iaccarino describes Sardinia and its wealth of food and wine. So as not to get lost among the island’s endless culinary delights with dishes whose names are often unintelligible to most people, it is better to be guided by the inspiration of local chefs who daily reinterpret authentic Sardinian cuisine but always with an eye on tradition and all those small, but significant touches (perhaps passed down from their grandparents) which allow the island’s authentic home-grown products to be enjoyed at their best. The result is a vademecum of Sardinian cuisine, “13 Sardinian dishes that you must try if you go to Sardinia”, the outcome of encountering the suggestions made by three Executive Chefs, in charge of cuisine at three Delphina hotels on the North Coast of Sardinia: Mario Tirotto at the Resort Valle dell’Erica at Santa Teresa Gallura, (here at work in the kitchens of the Ristorante Les Bouches), Pierluigi Putzu at the Hotel Capo d’Orso at Palau (watch the video of the Chef at work at the Ristorante Il Paguro) and Stefano Piras, at the Hotel Marinedda at Isola Rossa. There's something for every palate: from fish that are less well known in national cuisine such as skate, which becomes the main ingredient for a delicious hors d’oeuvres at the Petra Ruja restaurant at the Hotel Marinedda up to more traditional products such as mutton, which in the hands of chef Pierluigi Putzu becomes a tasty carpaccio paired with black truffle and Anglona parmesan (a pecorino cheese). Chef Mario Tirotto talks about his preference for local fish, including eel, grey mullet (from which the famous Cabras gold known as bottarga is taken), or even octopus, when "his grandfather put it in the pot, with the lid on and a minimum heat. Today’s technology means it can be perfectly cooked; the skin of the octopus remains unchanged, the texture perfect. It is not a betrayal of the past, it’s an improvement on that experience." Pasta, the queen of Italian cuisine, also has an important role on the island while the encounter with traditional Gallura cuisine takes place at the typical Li Ciusoni restaurant at the Resort Valle dell'Erica with specialities such as zuppa Gallurese (Gallura soup ndt): " hard stale bread, beef and mutton broth, cow’s cheese, a bit of mature pecorino cheese. Layers, layers, layers, and then in the oven, perhaps accompanied by a delicious ghisatu, a sort of tasty reduced veal meat sauce." And the famous Sardinian suckling pig? "If you find that it is just cooking slowly near the flames don’t miss it" .. it’s difficult to describe… you just have to taste it!